I still remember this question, and how it shook me almost 10 years ago. It was posed by Dawn Turner Trice, a columnist at the Chicago Tribune, in the wake of the Katrina tragedy. I was still in my process of understanding the depths of historical racism at that time. I was a pastor, and by then I had already come to the clear conclusion that diversity (a word I don’t really like anymore), reconciliation, and multi-ethnicity were important to the witness and call of the Church. But I still hadn’t fully grasped the difference between holding that as a conviction, versus having a comprehensive understanding of both how we got to this place, and how deeply the sins of racism still were embedded and ingrained within the very fiber of our country. When Dawn Turner Trice wrote her article, and specifically this line, I remember it burning a hole in my brain. It was so true. White America and Black America live in two very different worlds. As a pastor within a multiethnic church, that reality remains near the top of my consciousness on a regular basis (within this blog post I’m focusing on the poles of this struggle – it would take me too far down a different path to try to discuss how this might affect other racial-cultural groups). But then something happens within society, like the murder of Trayvon Martin (and the acquittal of George Zimmerman), or the murder of Jordan Davis, or now the murder of Michael Brown (see a good overview of the tragedy here), and we see once again just how true this remains. White America and Black America live in two very different worlds. There are exceptions of course, but at a macro-level it’s hard to overstate the gap. It’s apparent everywhere I look. Within my friendships, within church relationships, within my FB friends, within my Twitter community there is a night-and-day difference. One set of people are mourning, lamenting, fuming, and wrestling with what is just one more reminder of the rampant racism that’s still alive and active. Another set of people are… well, not. Some may be aware of it in the news, and even feel a degree of sympathy. But then others are immune to it, and it hasn’t even registered. And then others are in full defense mode of the tragic set of circumstances, explaining it away with various arguments. As I write this I am aware that it may sound like I am doing a lot of finger pointing, or that I am somehow trying to present myself as the enlightened White person. I’m not meaning to do that. I am as complicit in this whole mess as anyone, and am still trying to place myself before God and others with the hopes of becoming something more. There are not many things that provoked the Prince of Peace to use violent language (like nothing), but this was the one exception. When Jesus talked about unjust treatment and harm of children, he warned that the perpetrators would be better off having a large millstone hung around their neck and drowned than face the judgment that awaited them when they met their maker. We have witnessed a non-stop string of senseless murders of our children in our country. We can debate the details surrounding each case, but it doesn’t change the larger picture. Children are being killed, and there is a system that is perpetuating this violence. It’s serious business, and it has to be stopped. Ebony Adedayo wrote a great article today for Christianity Today on this, and its worth reading (check it out here). In it she references a website that one of the women in my congregation just forwarded to me earlier in the day. It reveals an absolutely astonishing fact: every 28 hours, a black man is killed in America by police or vigilantes. Can you even comprehend that? That this infuriates Black America is absolutely justifiable. Why wouldn’t it? The fact is though, it should infuriate far more of us — it should, in fact, infuriate all of us. There is a saying that gets brought up a lot in Chicago, and I cringe every time I hear it… mostly because I believe it’s probably true. Our city is one of the worst when it comes to youth violence, and it’s heartbreaking to see how many kids have died on our streets. I’ll be at a prayer vigil tonight around the corner from our church to remember the lives of two more kids who were shot and killed in our neighborhood. When conversations like this come up, the “Two America’s” reality is again obvious. The problem of violence (and all the surrounding factors that instigate it) is being constantly grieved and discussed in some circles, and largely ignored at others. Here is what is often gets said about the lack of concern in white circles… this is the statement that makes me cringe every time: As soon as white kids start getting shot and killed, this will become a national issue. What’s under this is the belief that our country values the lives of people at different levels (read values white lives over black lives), and therefore responds accordingly. It seems hard to argue this point, and even the possibility of it being true should be enough to wreck us all. The Bible couldn’t possibly condemn this type of thinking more strongly. The opening chapter of Genesis teaches us the doctrine of the Imago Dei – that every human being is created in God’s image, that every human being is valuable, that every human being has dignity, and that every human being deserves to be loved, protected, and fought for. We must re-center the Imago Dei. We must remember that every person matters, and that just because one group of people has more status in society than another doesn’t mean that they somehow have the right to look down upon or treat another human being as less than human. Whenever the Imago Dei is violated – no matter who it is – we must become infuriated. All lives matter to God!!!! To see people any less than this is an absolute violation of the heart of God. Let me go back to John 3, where Jesus says one can only see the kingdom by the transformational power of the Spirit. This imagery forms the very foundation of how Jesus talked about his ministry – he had come to pronounce and usher in the kingdom of God. Jesus is king, and he is building a kingdom, and he wants us to see and participate in the building of the whole enterprise. For Christ followers in particular, we have to remember that kingdom language points not just to individual people, but also to systems and structures. In 2000 a landmark book (particularly for White Christians) came out by Michael Emerson and Christian Smith called Divided by Faith. Dr. Emerson made the case that White Evangelicals were generally unable to participate in any type of authentic and transformational dialogue about racial reconciliation because they could only comprehend the problem at an individual level. The solution for the typical White person who struggles with racism was to become friends with someone of color. The solution for the typical person of color (from the White perspective) was to be opportunistic, work hard, and work their way up the economic ladder. I don’t think we can ever lose the individual component of reconciliation. White people really do need authentic friendships where they can learn and grow, and all people need to steward the gifts that God has given them and work hard to fully actualize their potential. But the conversation becomes absolutely dishonoring when we reduce the tragedy of many of these senseless murders into some type of referendum on how individuals could have handled the situation better. It just burns me every time somebody talks to me about how kids should learn how to be more respectful to police in inner city neighborhoods or should be better prepared for dealing with the various challenges they face. It completely ignores the incredibly powerful and systemic forces that are at work every day. If this idea is a new one, I would suggest immediately reading The New Jim Crow by Michelle Alexander as a starting point. She is a brilliant thinker, lawyer, and writer, and she lays out the history of mass incarceration in a way that is irrefutable. I’m not sure how anyone could read that in an unbiased way and then walk away thinking that the problems we are facing are primarily about individuals better navigating their opportunities. There are so many systemic forces at play in the persistent violence, abuse, neglect, and disparity that we continue to see. It’s impossible to have any type of meaningful and substantial conversation about how to change things without the common ground of seeing systemic evil and injustice. And for those who take the Bible seriously, re-read Ephesians 6. Paul the Apostle was real clear that our battle was not just against flesh and blood, but against principalities and powers. There are structural evils that have been in place since the dawn of our country’s existence, and those have got to be dismantled. Thank you, Daniel, for the heart-felt, researched, well-thought-out, well-written, and personal committed-to-action piece you have presented, here. It is these type of effort that will help propel all of us to see Gods’ Will for HIS KINGDOM COME on Earth as it is in Heaven.!! Thanks for this. It is simply very, very hard to get out of the box we find ourselves in, to try to at least empathize with the ones among us who are marginalized as well as brutalized. These are our brothers and sisters in Christ, in many cases, but even without that being true, they are still our fellow humans, loved by God, and like us, sought by God for redemption, reconciliation, and restoration. The love of Christ compels us to speak out for our brothers and sisters, our fellow humans, against this awful violence. As far as what we can do–I think you, and your church, are doing something very, very important–you are trying to form a community of people who comprise many viewpoints and cultures. I think that is what needs to be done. Has to be done. We have to deliberately choose to live together. I don’t know how it can be done broadly. There are decades and centuries of suspicion and misunderstanding. But it is my belief that the only way to get to know people, and to love them, and to accept them, is to live with them, share their lives, talk to them, work with them–and even suffer and bleed with them. I think he’s on to something. The only thing that will work is the very hard work of deliberately choosing to live with each other, side by side. I can’t say I’m doing this myself, so I can’t say that others should do this if I don’t. I’m just acknowledging that it has to be done, and in order for it to be done, the complex situations we all are in that tie us to our separations have to considered and ways found to make it possible to change. I am sharing this post, Daniel, in continued hope that other whites might be consumed by the Spirit & get it… I am so grieved, by this whole thing which I have witnessed for decades… and by my white friends who still can’t see it. Both are very painful! George Zimmerman did not murder Trayvon Martin, he killed him in self-defense. Many of the points you bring up in this post are valid and should be seriously pondered. However, misrepresenting facts and placing blame on one race over another is counterproductive and unfair. You say in your post, The solution for the typical person of color (from the White perspective) was to be opportunistic, work hard, and work their way up the economic ladder.We can discuss how today’s black youth ended up in such an endless cycle of poverty and crime but to demonize hard work and discipline as a legitimate solution is very short sighted. Today, on the streets of Chicago, you see young, black, teens with no respect for the law preying on the public as they storm our city in the form of flash mobs. As a self-defense instructor for 35 years, I can tell you that the moment you choose to take a 6 foot tall, athletic, 17 year old lightly you are in for the shock of your life. You can argue whether George Zimmerman should have gotten involved at all that night but the only thing that kept him from ending up in a coma was the gun that he very reluctantly used to shoot an attacker who was well on his way to inflicting serious bodily harm on that Hispanic neighborhood watchman. I don’t know what happened in Ferguson and neither do you so you really should refrain from condemning the policeman until all the facts are in. Thanks Daniel. I appreciate your stepping up in this issue and especially for spelling out the systemic nature of the problem (and why so many Christians fail to see it). Sadly, I think you’re right about the lack of outrage among white people over Michael Brown’s killing and so many others. Until white people get as outraged as black people, it’s going to be an uphill battle. This is very consistent with the picture at the top of this blog. 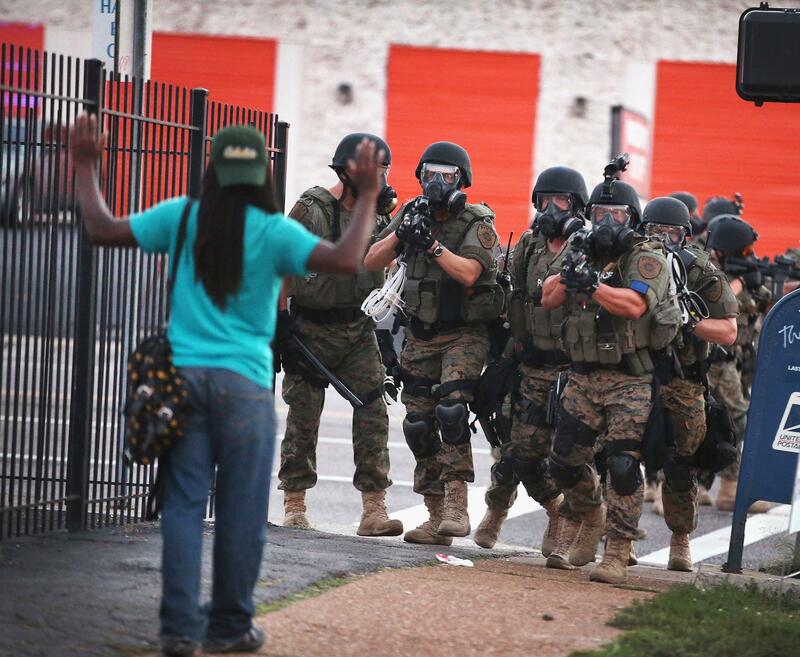 Are those “peace officers” or military personnel? In my opinion it is now a very fine line. This is an important topic for anyone that may be concerned about freedom and liberty, as well as injustice, indifference, and loving your neighbor as yourself. Thanks John – I appreciate the link!